Can it be? Thirty-three years ago as I write, I was basking in the glow of having just seen Crosby, Stills & Nash show at the Mann Music Center, an open-air venue, in Philly. The ticket stub for the concert, which was paper clipped into my Doonesbury-themed desk diary for decades, is currently AWOL…not that it matters much. I have my memories. Two weeks earlier, on July 24th, I saw Roger Waters (with Eric Clapton on guitar) at the Spectrum – another great show despite the former Pink Floyd bassist chiding the audience to “stop the fookin’ whistling.” (He apologized after intermission; in England, he said, whistles equate with boos, but Eric explained to him that in the States – or, at least, Philly – they equate with cheers.) And nine days later, on the 14th, I found myself at the back of the Mann’s ample lawn, right where it turns to pavement, to see Huey Lewis & the News. In that same time span, I picked up three albums: Stephen Stills’ Right by You, Otis Redding’s Best of and the Byrds’ Greatest Hits, Vol. II; and, as the month unfolded, just two more: John David Souther’s Home by Dawn and Jefferson Airplane’s Volunteers, which I already owned on cassette but wanted on vinyl. I wasn’t quite walking in lockstep with pop culture, in other words, though I owned eight of the top 25 albums listed in this month’s Record charts. And if you’re feeling a slight twinge of deja vu – that’s because, yes, we have been here before. 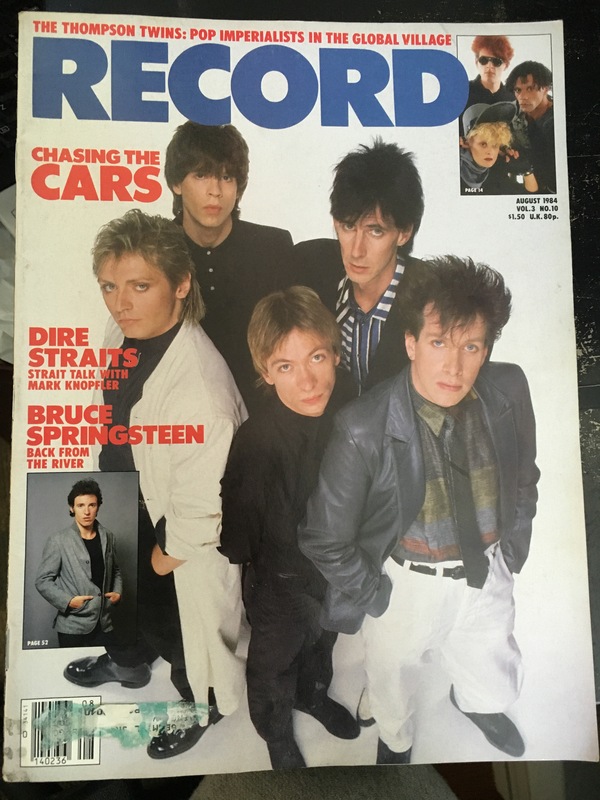 My plan to spin this intro into a Top 5 based on this month’s Record magazine has been waylaid by forgetfulness on my part: Once I retrieved said issue from the temperature-controlled vault and saw the cover…oops. l featured it in a Top 5 on January 30, 2016. There was good news on the horizon, however: On the same day that I saw Huey Lewis, I interviewed for and scored a new job as sales associate at a major department store – in the Domestics department. I learned to fold towels and sheets, and keep my cool when accosted by overzealous customers. 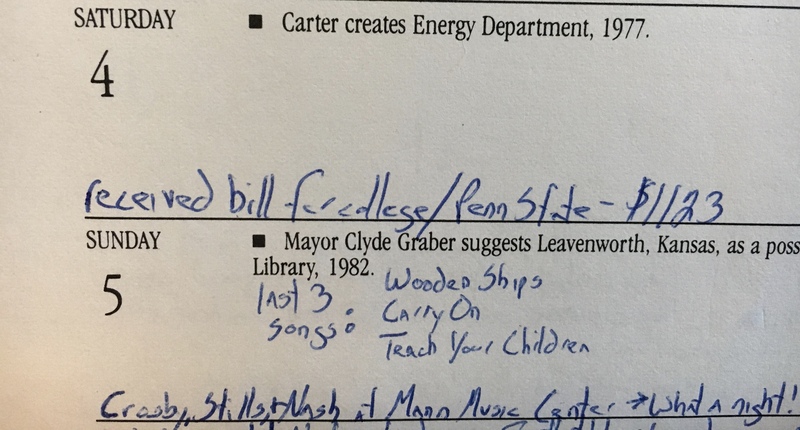 Also, an interesting side note – as my desk diary shows, the day before that CSN concert, I received the bill for the fall semester at Penn State Ogontz, which was one of a dozen-plus PSU satellite campuses scattered across the commonwealth. The total cost: $1123. Today, to attend the same campus – which has since been renamed Penn State Abington – the cost is $6770 for tuition, $236 for the student fee and $252 for the Information Technology Fee – $7258 altogether. That’s more than twice the (cumulative) rate of inflation! That’s just not right. In the wider world, the dominant stories in the news revolved around the Summer Olympics, which were taking place in L.A. The presidential race between incumbent Ronald Reagan (R) and challenger Walter Mondale (D) was in the offing, but the campaign was on the back burner – unlike today, political campaigns were not year-round exercises. The economy was doing okay, but not great: Unemployment stood at 7.5 percent on August 1st; and inflation was 4.29 percent. Popular movies of the summer included the feature-length music video known as Purple Rain, which opened on July 27th; Ghostbusters and Gremlins, which had been in the theaters since June 8th; and not Police Academy, which was released in March and, at this point in time, was past the end of its life cycle. 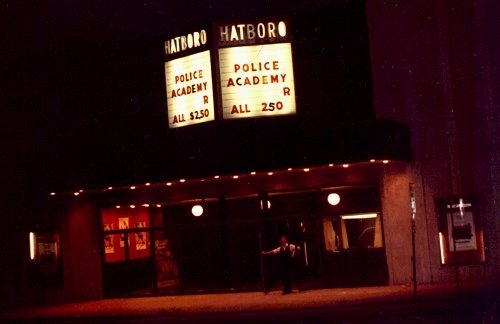 (Those were the kinds of films the Hatboro Theatre had towards the end.) On the TV front – aside from the Olympics, everything was in repeats. TV in the summertime was always dull, in those days; the (wrong) assumption was that few people watched. Anyway, enough of this voluminous intro. 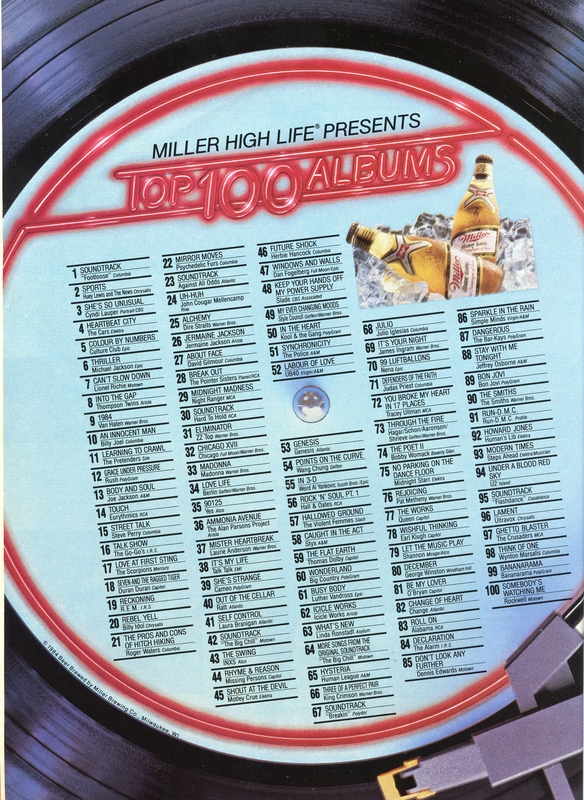 Here’s Today’s Top 5: 33 Years Ago Today (Aug. 6, 1984), though the charts – courtesy of my go-to site for such things, Weekly Top 40, are for the week ending the 4th. They’re the top songs of the week. 1) “When Doves Cry” by Prince. The now-classic ode to pigeon love ruled supreme for the fifth week in a row. 2) “Ghostbusters” by Ray Parker Jr. The theme to the original Ghostbusters clocks in at No. 2. 4) “Dancing in the Dark” by Bruce Springsteen & the E Street Band. Slipping to No. 4 from No. 3 is this great song from the Boss, which remains a delight to hear in concert. 5) “What’s Love Got to Do With It” by Tina Turner. In its 11th week on the charts, this instant classic – which, according to Wikipedia, had been first offered to Cliff Richard(!) – jumps from No. 9 to No. 5 on its way to No. 1. 6) “The Glamorous Life” by Sheila E. This semi-mainstay of today’s oldies radio (at least as heard on WOGL-FM in Philly, which I’ve been groovin’ to of late) reaches its top spot on the charts this week…No. 31. 7) “Cruel Summer” by Bananarama. The seventh single by the British girl group was its first U.S. top 10 single. Here, in its third week of release, it’s one of the “power plays,” jumping from No. 55 to 43. 8) “Let’s Go Crazy” by Prince. And, to bookend this Top 5, here’s another chart entry from the Purple One, a “power play” that enters the charts at No. 45.